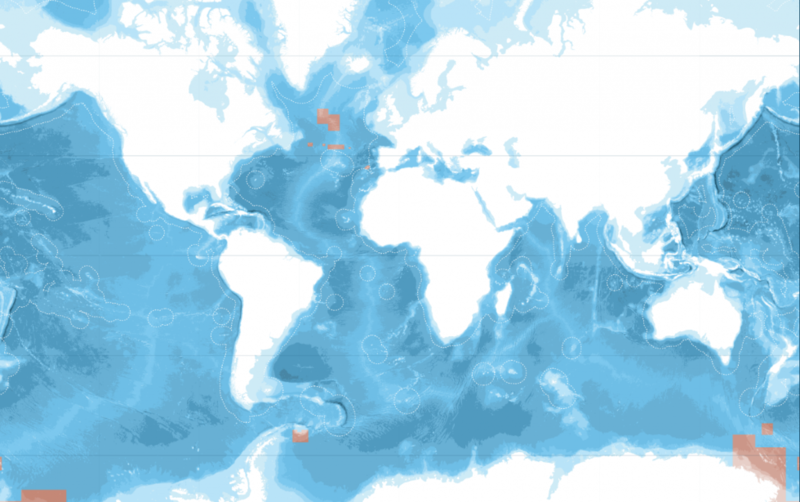 Great areas of our rubbish are known to form in parts of the Pacific and Atlantic oceans. But no such “garbage patch” has been found in the Southern Indian Ocean. Every year, up to 15 million tonnes of plastic waste is estimated to make its way into the ocean through coastlines (about 12.5 million tonnes) and rivers (about 2.5 million tonnes). This amount is expected to double by 2025. As plastic materials are extremely durable, floating plastic waste can travel great distances in the ocean. Some floating plastics collect in the centre of subtropical circulating currents known as gyres, between 20 to 40 degrees north and south, to create these garbage patches. Here, the ocean currents converge at the centre of the gyre and sink. But the floating plastic material remains at the surface, allowing it to concentrate in these regions. The best known of these garbage patches is the Great Pacific Garbage Patch, which contains about 80,000 tonnes of plastic waste. 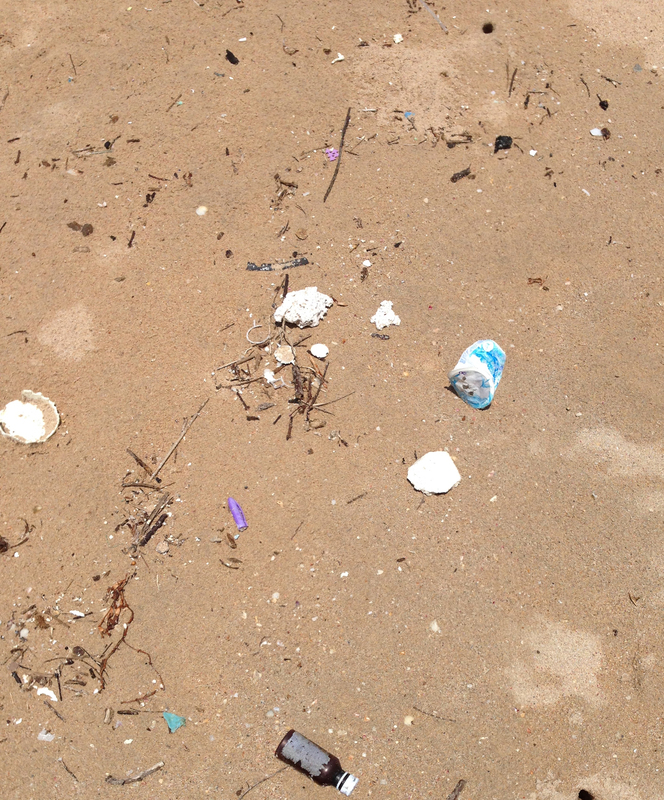 As the National Oceanic and Atmospheric Administration points out, the “patches” are not actually clumped collections of easy-to-see debris, but concentrations of litter (mostly small pieces of floating plastic). Similar, but smaller, patches exist in the North and South Atlantic Oceans and the South Pacific Ocean. In total, it is estimated that only 1% of all plastic waste that enters the ocean is trapped in the garbage patches. It is still a mystery what happens to the remaining 99% of plastic waste that has entered the ocean. For example, it has been estimated that up to 90% of the global riverine input of plastic waste originates from Asia. 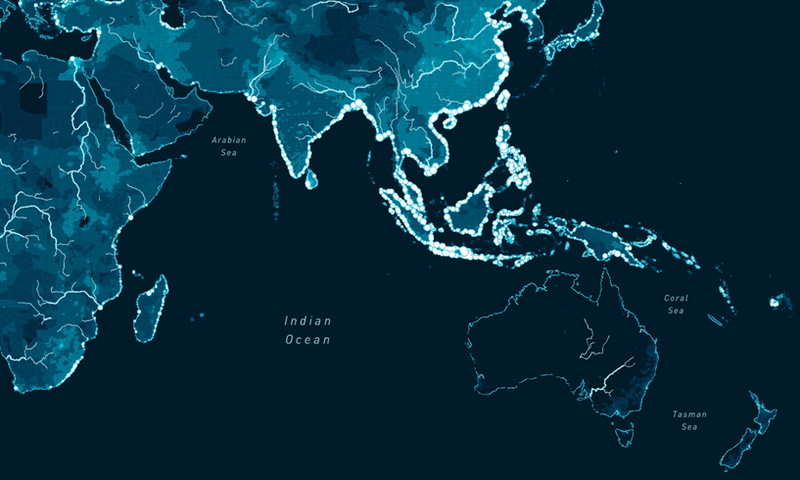 The input of plastics to the Southern Indian Ocean is mainly through Indonesia. The Australian contribution is small. The Indian Ocean has many unique characteristics compared with the other ocean basins. The most striking factor is the presence of the Asian continental landmass, which results in the absence of a northern ocean basin and generates monsoon winds. As a result of the former, there is no gyre in the Northern Indian Ocean, and so there is no garbage patch. The latter results in reversing ocean surface currents. In contrast to other ocean basins, the Indian Ocean is under-sampled, with only a few measurements of plastic material available. As technology to remotely track plastics does not yet exist, we need to use indirect ways to determine the fate of plastic in the Indian Ocean. We used information from more than 22,000 satellite-tracked surface drifting buoys that have been released all over the world’s oceans since 1979. This allowed us to simulate pathways of plastic waste globally, with an emphasis on the Indian Ocean. 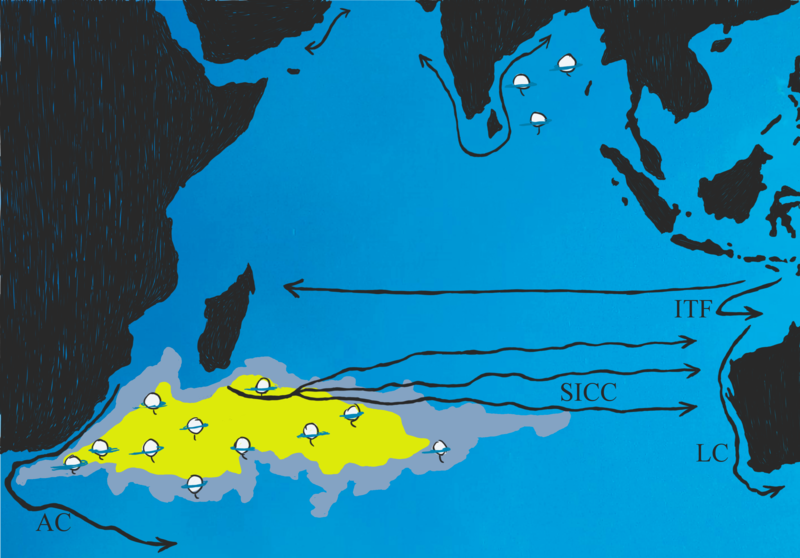 Because of the Asian monsoon system, the southeast trade winds in the Southern Indian Ocean are stronger than the trade winds in the Pacific and Atlantic Oceans. These strong winds push floating plastic material further to the west in the Southern Indian Ocean than they do in the other oceans. This allows the floating plastic to leak more readily from the Southern Indian Ocean into the South Atlantic Ocean. 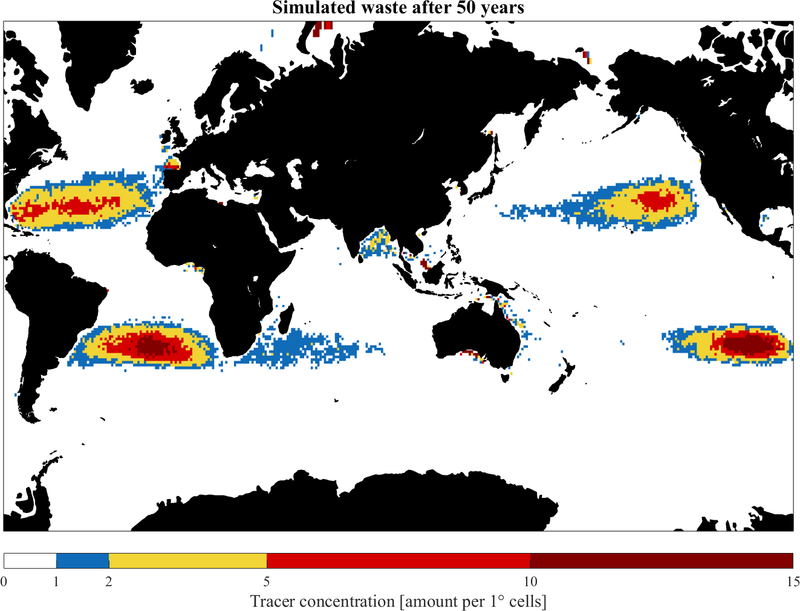 All these factors contribute to an ill-defined garbage patch in the Southern Indian Ocean.Simulated concentration of floating waste over 50 years in the Indian Ocean. It is also likely that floating plastics will ultimately end up on beaches all around the Indian Ocean, transported by the reversing monsoon winds and currents. Which beaches will be most heavily affected is still unclear, and will probably depend on the monsoon season. Our study shows that the atmospheric and oceanic attributes of the Indian Ocean are different to other ocean basins and that there may not be a concentrated garbage patch. Therefore the mystery of all the missing plastic is even greater in the Indian Ocean. BBC : Can you spot ocean plastic from space? Explorer and private equity investor Victor Vescovo is attempting to reach the deepest points of the world's five oceans. Vescovo's $48 million submarine is designed withstand the most extreme underwater conditions. 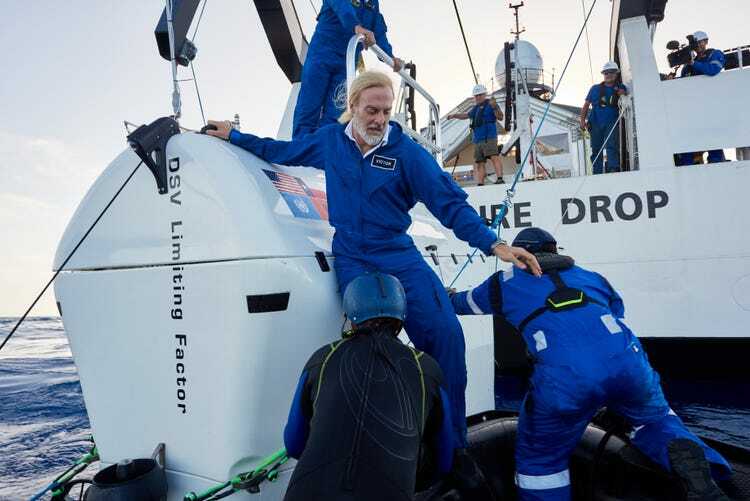 He has already finished three deep-sea dives, putting him on track to finish his expedition by September. While speaking at the TED 2019 conference, Vescovo revealed that he discovered a mysterious new species on his third dive in the Indian Ocean. At age 53, explorer Victor Vescovo has already climbed the world's seven highest peaks. Now he is on a mission to explore the bottom of the ocean — a treacherous territory that remains largely untouched by humans. "I think it's almost cliche at this point, how people mention that 70% of the Earth is ocean, and we've only explored 5% of it," Vescovo told Business Insider. 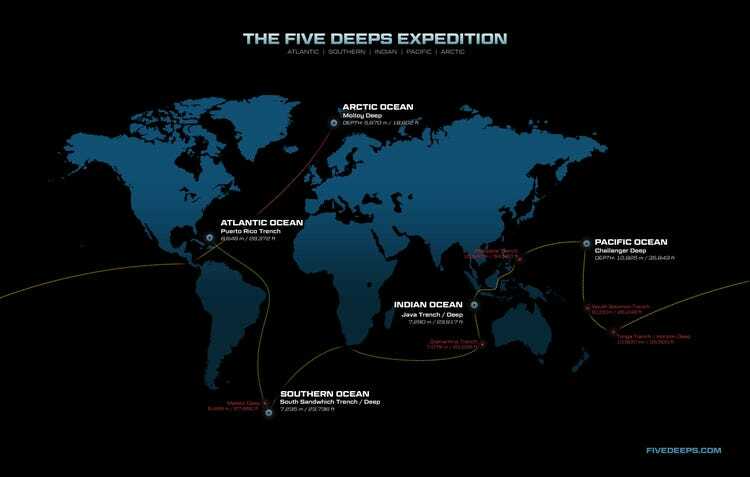 That fact inspired Vescovo's quest to visit the deepest points of all five oceans — a mission appropriately called the Five Deeps Expedition. In December, Vescovo became the first person to reach the deepest part of the Atlantic Ocean. He traveled to the bottom of the Puerto Rico Trench — 27,480 feet below the surface (8,376 meters) — in a $48 million titanium submarine. At that depth, any message you send takes 7 seconds to be heard. By comparison, radio waves sent back-and-forth from the moon during the Apollo missions took less than 3 seconds to transmit. 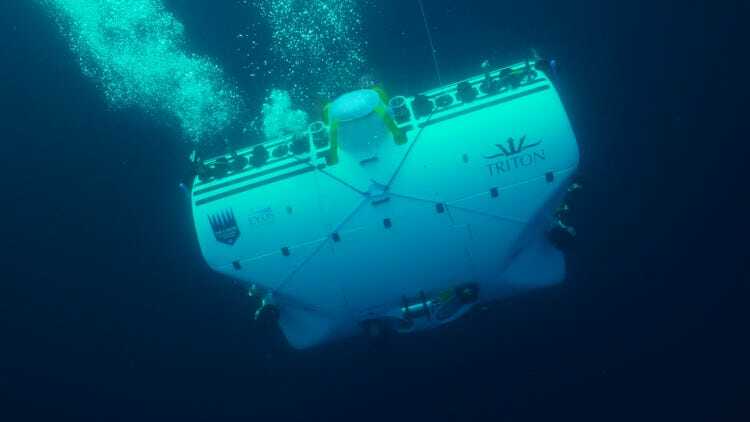 Since that first record-breaking dive, Vescovo has successfully completed two other expeditions in the Triton 36000 submarine. On his third dive, at the bottom of the Java Trench in the eastern Indian Ocean, Vescovo discovered a mysterious species that's never been seen by humans. His final mission as part of the Five Deeps project will be a dive in the Arctic Ocean in September 2019. The explorer discussed these efforts on Wednesday at the TED 2019 conference in Vancouver, Canada. Here's what he revealed about his death-defying journey. Vescovo's expedition is designed to take him to the deepest points of all five oceans. Vescovo described the bottom of the ocean as "an incredibly hostile environment." But in general, being underwater in a submarine is "relatively peaceful," he said. If he's successful, Vescovo will eventually become the first person to have climbed to the highest point of each continent and reached the deepest point of each ocean. About a decade ago, billionaire Richard Branson tried to embark on a similar diving feat, but the project was suspended after it failed to build a submarine that could sustain multiple dives. Vescovo's journey began in December 2018 with the Puerto Rico Trench dive, and is expected conclude in September 2019 in the Arctic Ocean. "These aren't going to be one-off dives that are experimental in nature," Vescovo told Business Insider. "We are trying to construct a system that opens the door to the ocean." With his first dive, Vescovo became the first person to reach the deepest part of the Atlantic Ocean. His dive in Puerto Rico took him 27,480 feet below the water's surface. "It felt great to get to the true bottom of the Atlantic Ocean for the first time in history," he said in a release after he returned to the surface. His second dive took place in February in the South Sandwich Trench, an area between South America and Antarctica. This time, he traveled 24,400 feet below sea level. On his third dive in the Indian Ocean, Vescovo discovered a mysterious species that had never been seen by humans before. The Five Deeps Expedition successfully dived to the deepest point in the Indian Ocean, in the Java Trench. 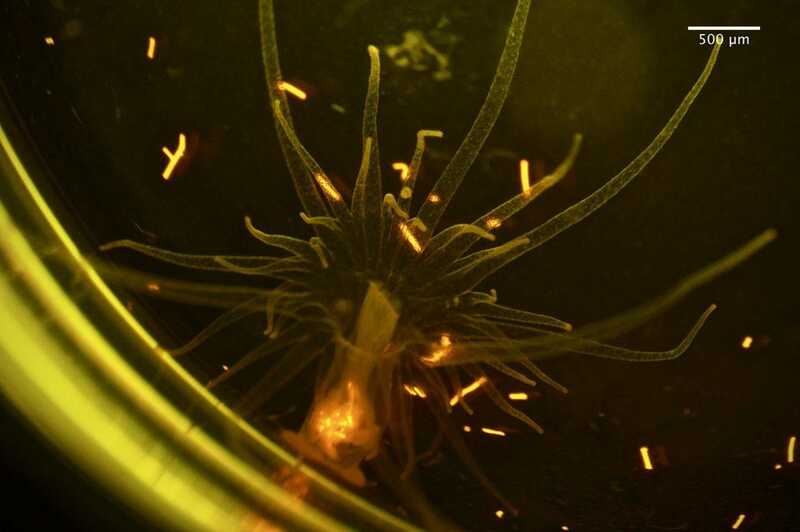 During one dive, what is believed to be a new species of Jellyfish was recorded on video. The animal resembles a bottom-dwelling jellyfish, but Vescovo said him team isn't quite sure about its species. The team has discovered three or four new species on every deep dive they've done, but Vescovo noted that this particular animal was "very, very unique looking" compared to the others. Vescovo's $48 million Triton 36000 deep-sea submarine took three-and-a-half years to design and build. He's confident that it will continue to keep him safe underwater. "We kind of have a running joke within the development team that I don't trust a lot of things, but I do trust math. I do trust titanium," he said. "We have very high confidence that the systems will survive these extreme environments." Vescovo said that at the ocean's most extreme depths, pressure levels are 1,100 times stronger than at the water's surface. So his team tested the submarine at pressures beyond that of the deepest parts of the ocean floor. In two weeks, Vescovo will attempt to reach the Challenger Deep — the deepest known point in the ocean. Challenger Deep is located at the bottom of the Mariana Trench in the Pacific Ocean, almost 7 miles underwater. It's farther down from sea level than Mount Everest is up. "We believe, hopefully, given our track record, that we'll be successful," he said. Fewer people have reached Challenger Deep than have walked on the moon. 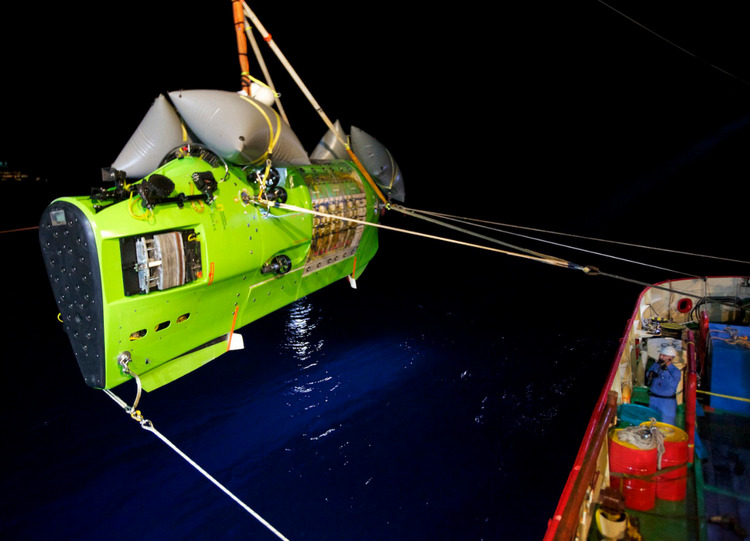 The Deepsea Challenger submersible carried James Cameron into the Mariana Trench. Hundreds of people have ventured into space, and a dozen have landed on the moon. But only three have reached Challenger Deep. Film director James Cameron went there in 2012, and explorers Jacques Piccard and Don Walsh did it more than 50 years earlier in 1960. But that's it. Vescovo plans to go down multiple times. Vescovo said diving is the opposite of mountain climbing, but both require "calculated risks." "In mountain climbing ... you are completely subjected to the weather and you feel freer because you're surrounded by a lot of open space. You feel the biting cold and you feel the wind," he said. But deep-sea diving, by contrast, is a "far more technical mission." While speaking at TED, Vescovo said the experience was "kind of like the Space X of ocean exploration, but I pilot my own vehicles." "Elon [Musk], if you're listening," he said, "I'll give you a ride in mine if you give me a ride in yours." This new AIS transponder (from DigitalYacht) increases the transmission rate relative to the yacht’s speed. A new generation of AIS B+ transponders claims to make leisure boats more visible. Automatic Identification Systems (AIS) may have originally been conceived as a collision avoidance system for commercial shipping but in recent years they have become a popular safety aid for leisure boats as well. 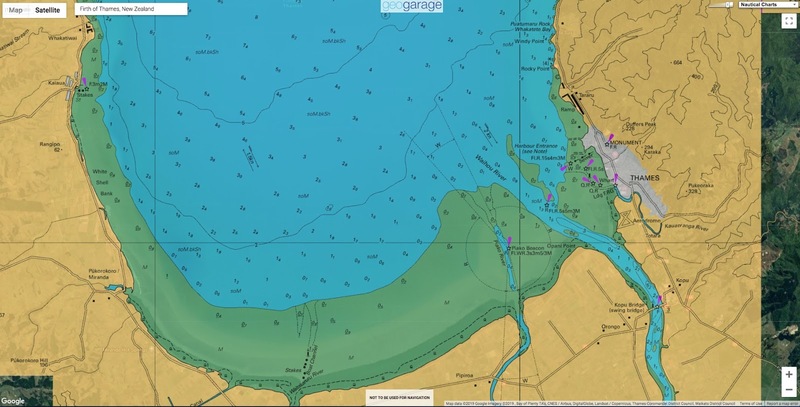 Not only does AIS allow you to see and be seen, even when out of sight due to darkness, fog, land or range, but it is also becoming a useful navigation tool now that transponders are being fitted to beacons, buoys and other aids to navigation. 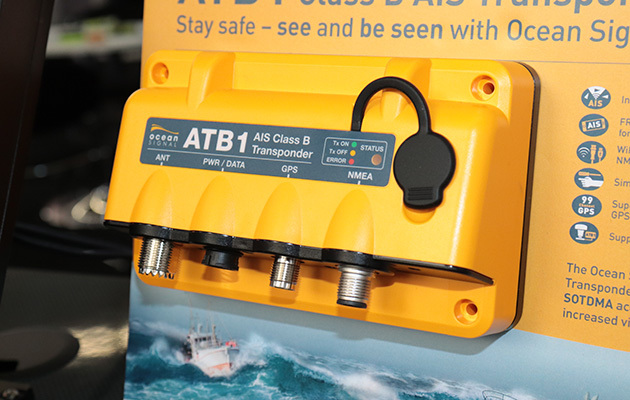 AIS SARTs (Search And Rescue Transponders) have also been approved for use as man overboard devices, which can be picked up by SAR helicopters as well as AIS-equipped surface craft. and Class B transponders that allow smaller fishing and leisure vessels to fit a lower power, lower cost transponder. The trouble is that leisure boats equipped with AIS B transponders may not be quite as visible as you think, especially in busy areas with multiple AIS targets. Now a change in the rules and a new generation of AIS B+ transponders has helped level the playing field, so what are the changes and how do they affect potential buyers? To help explain the changes you first need to understand how AIS works. An AIS transponder consists of a GPS receiver and a VHF data radio. The transponder transmits this GPS position in digital form on two VHF channels dedicated to AIS (161.975MHz and 162.025MHz). In order to avoid multiple devices transmitting at the same time, AIS transponders use a system called Time Division Multiple Access (TDMA). Each transponder communicates with others in the area to avoid clashes and claim its own short 26.6 millisecond time slot. The system allows up to 4,500 craft to operate in the same vicinity, automatically giving priority to those that are closest and therefore likely to be at greater risk of collision. The Class B+ is an AIS transponder that transmits in 5W rather than 2W. It ensures transmissions are more reliably received in busy areas. The increased power makes it suitable for AIS tracking. Class B+ also features SOTDMA – so it ‘books’ its transmission slots on the AIS frequency in advance. The transponder also increases the transmission rate relative to the vessel’s speed. However, the way different classes of transponder get their time slot varies. Class A transponders use a system called Self Organised Time Division Multiple Access (SOTDMA), which enables them to negotiate with other Class A transponders to reserve a time slot and book future ones. Class B transponders use a different technology called Carrier Sense Time Division Multiple Access (CSTDMA). This allows Class B transponders to listen in to Class A transponders and grab an empty time slot to make their transmission. The system is designed so that Class A transponders always take priority over Class B ones, meaning that a Class A transponder will occasionally steal a time slot from a Class B one and force it to delay its transmission until another empty slot appears. The number of transmissions that a transponder makes varies according to several different parameters, including Class (A or B), speed, navigation status and whether it is manoeuvring. The Class A transponder of a fast-moving ferry may output its position every couple of seconds while a Class B-equipped pleasure vessel will only transmit every 30 seconds. A Class A transponder also transmits at 12.5W while a Class B transponder only transmits at 2W – a third of the power of a 6W handheld VHF. 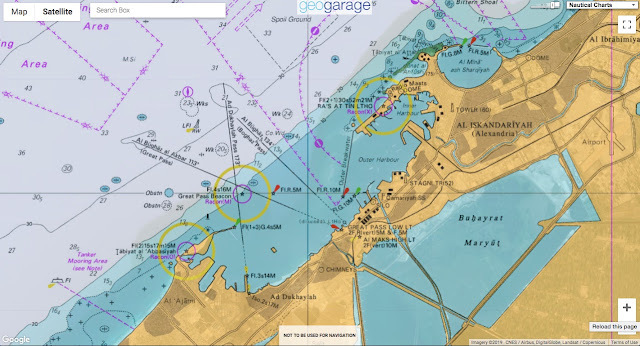 This restricts Class B transmissions to a maximum range of 8-10 nautical miles and means that traditional Class B transmissions are often not received by the AIS satellites that provide global vessel tracking. The new Class B+, otherwise known as Class B SOTDMA or Class B 5W, bridges the gap between Class A and Class B transponders, offering clear advantages for some types of vessels and applications. Class B+ uses the same SOTDMA technology as Class A and therefore has the same priority when it comes to reserving a time slot, guaranteeing that it will always be able to transmit, even in busy AIS congested waters. It also increases the transmission rate in line with your speed (but is unaffected by other manoeuvres), giving other vessels a clearer and more up to date view of where you are. While an AIS transponder is no replacement for a radar, it can help you be seen by commercial traffic. Ocean Signal has also introduced a Class B AIS transponder that allows leisure users access to the type of Class A service previously restricted to commercial shipping. For displacement motor boats the more frequent updates may not make a big difference, but a planing power boat travelling at 23 knots will move 360 metres in the 30 seconds it takes one of the older Class B transponders to transmit its next signal (or 0.5nm at 30 knots). On a boat equipped with a Class B+ transponder travelling at 23 knots or more, the update rate is 5 seconds, so would only travel 60 metres between updates. Finally, Class B+ transponders have a higher power transmission of 5W instead of 2W, which not only increases the range over which it will be received by other boats (assuming there is good antenna height and performance) but also significantly improves the ability of AIS satellite receivers to track your position. Which type should I fit? The answer depends on the type of boat you have, the sort of cruising you do and the budget you’re prepared to spend. The cheapest solution is to fit an AIS receiver or download one of the many apps that use shore-based reception networks. This is fine for showing AIS traffic in your vicinity and allowing you to communicate with them using their MMSI number, but it doesn’t make your boat visible to other AIS users. Class A transponders are at the opposite end of the scale but cost around £2,000, have an integral AIS display and could be considered overkill on a smaller boat that is predominantly used for coastal cruising. It’s also something of a myth that big ships have the option to ‘switch off’ Class B transmissions in busy areas. There is no filter option on commercial or leisure AIS receivers, so provided it picks up a Class B transmission, it will trigger collisions risk alarms just like a Class A one. Only when overlayed onto a big ship’s ECDIS screen can the ship’s master choose to filter out the visual clutter of Class B targets (but not the transmission itself). For smaller craft a Class B ‘black box’ transponder costing around £500 and linked to a multi-function display should be fine. However, the limited range and frequency of transmissions could prove a drawback, particularly on faster craft or those venturing further afield where the higher transmission power will significantly improve the ability of AIS satellites to track your position once out of range of surface-based VHF. In these circumstances spending the extra £150-£200 for a Class B+ transponder makes good sense. None of them should be seen as a replacement or alternative to a radar because they don’t pick up land, squalls or other boats and obstacles that don’t have a transponder fitted. Digital Yacht, Raymarine, Simrad, Garmin and Ocean Signal all offer Class B+ transponders for around the £700 mark. 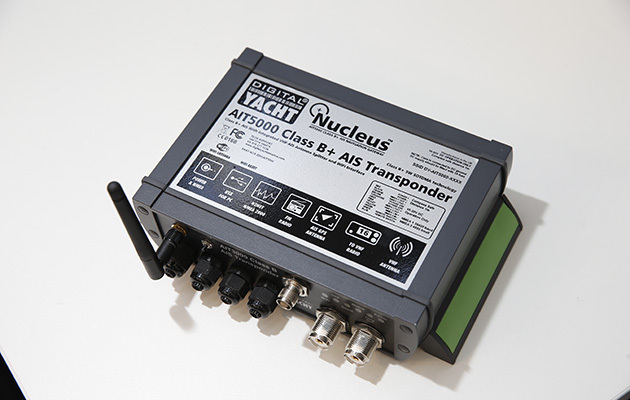 If you’re looking to fit AIS for the first time or to upgrade an existing Class B set, a Class B+ transponder looks like the logical next step. Rising accidents and crowded oceans: will self-sailing ships be next? Artificial intelligence is infusing all modes of transit, reshaping how we travel from A to B. Perhaps most evident is in the automotive industry, which saw investors pour $4.2 billion into autonomous driving technologies. A key emphasis has been the development of Advanced Driver Assistance Systems (ADAS), which could prevent nearly 30 percent of all U.S. car crashes and save over 10,000 lives annually. But while ADAS has already begun to make the roads safer, the development and adoption of similar technologies have been much slower in the maritime industry, where an ADAS-type innovation is sorely needed. A report by the European Maritime Safety Agency shows that accidents are on the rise in increasingly crowded waterways, from 2,000 in 2011 to an estimated 4,000 in 2017. So why can’t the industry simply adopt tools from the automotive market? Simply put, the maritime industry presents a vastly different set of needs, and training ships to navigate autonomously presents an array of challenges that the automotive industry does not face . But while automotive innovations are not directly transferable to the maritime world, the industry can move closer to “self-sailing ships” by building systems that meet the maritime domain’s unique needs. 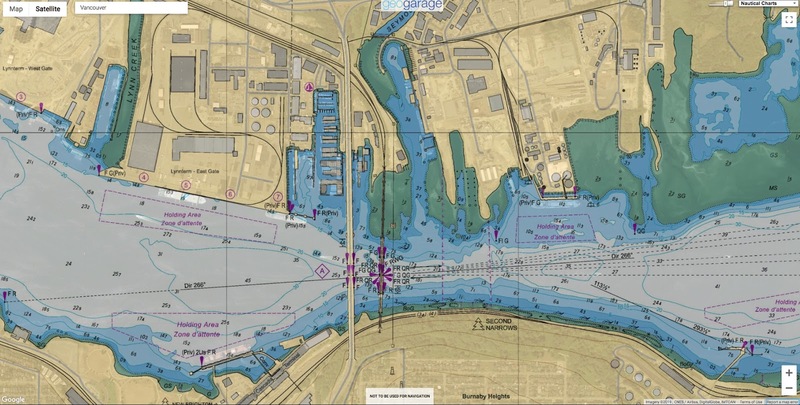 The water’s inherent environmental and navigational challenges illuminate the key obstacles to innovation confronting the maritime industry, even amid new advances in sensors and data science. Consider the differences in traffic regulation between cars and ships. While both can theoretically rely on others to operate according to the established “rules of the road”, the highly defined structure of every inch of the road makes it easier for autonomous and semi-autonomous cars to navigate and to predict the behavior of other cars. Outside of port areas, traffic for ships is less regulated. Concepts like traffic lanes, red lights, and other signage simply don’t exist. Moreover, even in areas with rigorous regulations such as near ports and in crowded waterways, accidents occur with alarming frequency due to overcrowding and human error – the latter accounting for up to 96 percent of maritime accidents. For cars, safe driving usually requires visibility of a few hundred feet; if visibility is hazy, vehicle-to-vehicle networks can convey information about the car’s surroundings, still allowing for near-instant reaction time. 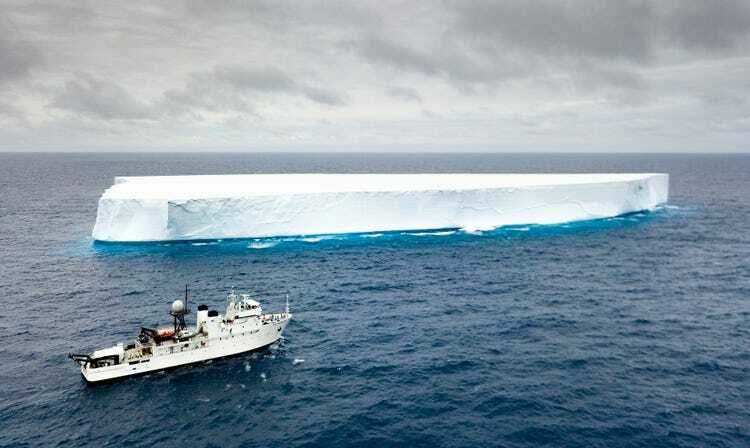 However, ships, particularly large vessels with slow turn rates, can require up to six miles of open water to adjust course and avoid collisions, so ample advance notice is crucial to shift directions and avoid a collision. Ships, then, must look after themselves – and while sensors can aid in this task, their reliability hinges on visibility and the ability to identify vessels and hazards at a great distance. Given the frequency of storms, fog, moonless nights, and other weather events, ships often lack the visibility necessary for sensors to provide the needed information. All of these sensor problem will be overcome – but that won’t spell the end of the maritime industry’s technological challenges. 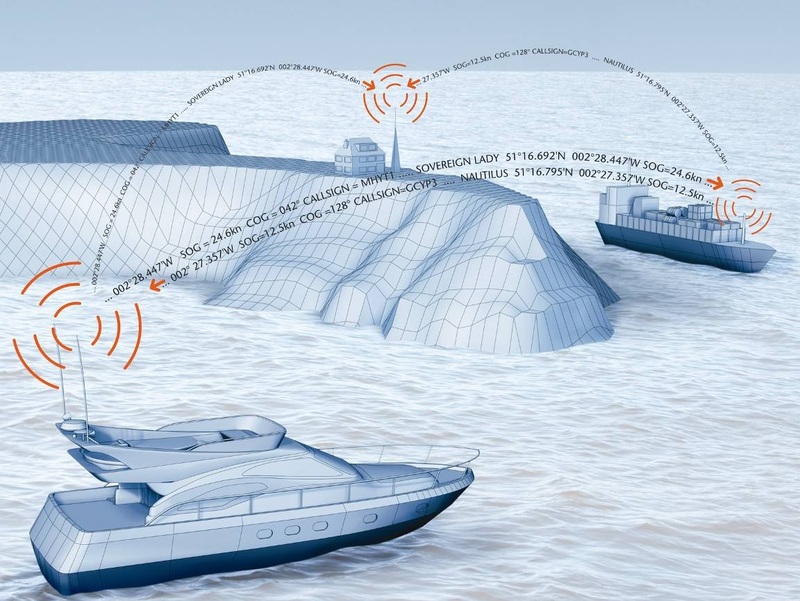 For shipping to attain greater autonomy, vessels will need AI systems that can deftly navigate the dynamic and frequently turbulent environments typical of the waters. Take data – the lifeblood of AI. Over the course of a weeks-long voyage, a ship will only have limited interaction with other vessels, meaning that relatively little data collected during the voyage will prove useful for training AI. Whereas cars encounter anomalies and edge cases on a daily basis, thereby guiding the development of autonomous systems, a shipping database with such information is much more difficult to build, and while the process of collection of data is underway, much work remains. Overcoming the hurdles to autonomous shipping will entail a process of honing industry-specific technological solutions. 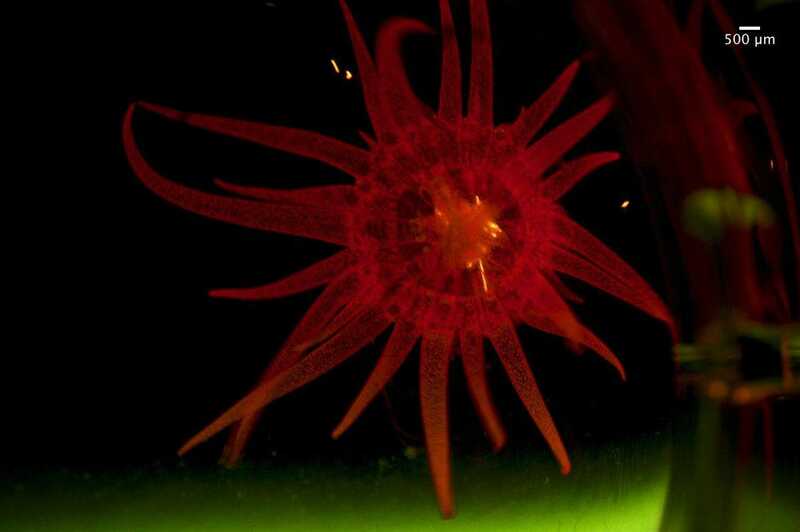 New sensors that provide visibility even in the lowest light, such as thermal cameras, need to reliably perform in the difficult conditions that are commonplace in the oceans, from hail to rain to gale force winds. Such maritime tailored technologies will be essential to securing industry buy-in. But the adoption of those sensors and cameras alone are not enough. They will need to be integrated into navigational systems that are capable of recognizing hazards from miles away in zero visibility conditions. That requires that the systems and algorithms that operate them be put through extensive real-world training to ensure the systems are able to effectively classify the hazards a ship will face on the water, for both routine and edge case scenarios alike. Given the current challenges, full autonomy is still years off, and even when it is achieved, crews won’t be eliminated, rather they will continue to play a vital part in shipping operations, from monitoring system performance to delivering goods. Solutions must be designed with crews’ needs in mind. Like autonomous cars, autonomous shipping promises to make transportation safer, cheaper, and more efficient. But while automotive technologies like ADAS and others can serve as a reference point, the maritime industry will need to chart its own course to reach autonomy. Preparations for the voyage from the Caribbean to Europe need to begin before you leave home, but what should you consider? By early summer the peak Caribbean season is coming to a close, ushered out by a fusillade of big regattas. Then, with summer returning to the northern latitudes, crews begin the return leg of their migration back home. While most people focus on crossing the Atlantic from Europe to the Caribbean, the voyage back to Europe or the US east coast is equally important – in some ways more so. The road home can be more testing, but it is also varied, and planning for it should ideally shape your preparations from the time you plan to leave home for a season in the sun. What should you weigh up in your crew and boat preparations and which route and strategy is best? You could, of course, always take the easy way out – remember that old saw that nothing goes to windward quite like a 747! You could get your boat sailed home by a delivery crew, or shipped back to the Mediterranean or northern Europe. These options, once the preserve of big motorboat owners and superyachts, are gaining popularity with mainstream cruisers, especially the time-pressed – in fact, a couple of owners I interviewed at the Caribbean 600 this year had their yachts shipped out from Europe and had booked them back by ship later in the season. Nevertheless, each year, around 1,000 yachts arrive in Horta en route to Europe (the total was 1,232 in 2015, to be exact). 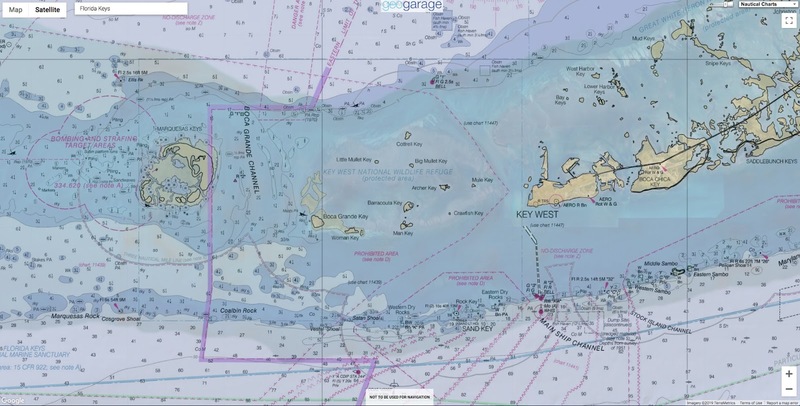 Yachts mainly stop here in May and June and around half have come direct from a Caribbean island, while a majority of others arrive via the staging post of Bermuda. A return voyage from the Caribbean to northern latitudes can be testing for boats and crew. The route back is a well-travelled one, but it is a very different proposition to the way out. The days will be lengthening as a crew sails north-east, yet the temperatures are falling and the weather can be very varied and occasionally testing. But it is also one of the most interesting voyages, and the almost mandatory stop in the Azores means you’ll visit some of the most unspoilt, hospitable and interesting islands anywhere in the world. Plus there is the undoubted satisfaction of knowing that you are closing the circle of your Atlantic circuit by your own efforts and skills. “We look at the west-east transatlantic as very different from the ARC or indeed any of the other ocean trips we do because it can be largely upwind and has potential for heavy weather,” says Dan Bower. 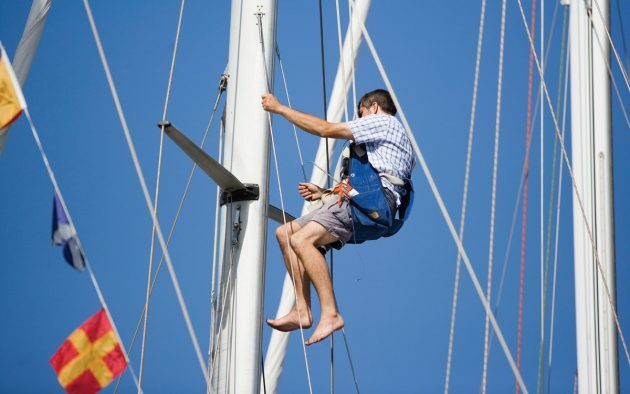 Make regular checks on sails and rigging, looking particularly for chafe damage. 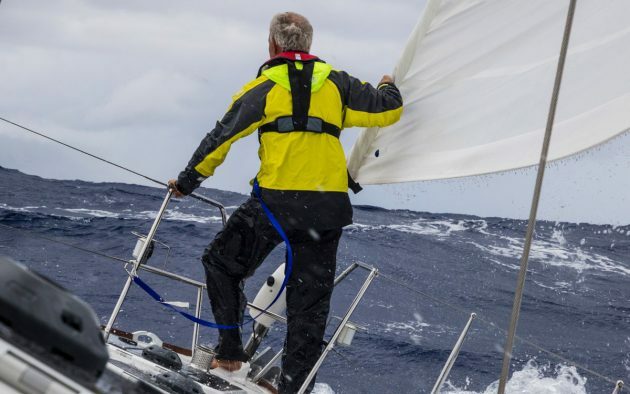 Given this, you’ll need to think from the outset about your upwind and stronger wind sails, and your yacht preparations for the route across to Europe. So when you consider the outlay for an expensive downwind sail inventory, for example new spinnaker or Parasailor, don’t forget the good condition mainsail with perhaps a fourth reef and the strong staysail that will be just as invaluable on the way back. 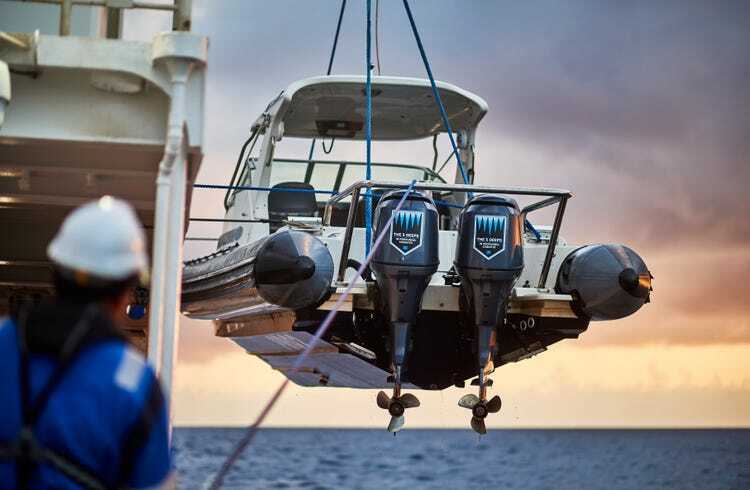 Preparing your boat for everything from flat calms to gales is paramount, and after a lazy season in the Caribbean everything needs to be checked over. Skip Novak’s Storm Sailing Series features a run through some of the essential deck checks. Dan Bower also emphasises these basic checks. “A good inspection and rig check before departure is a must, and we rig for heavy weather with our smaller headsail on the furler and have the staysail ready to go. “We also consider taking some extra fuel on board to give options around the high. Because of the water that will be shipped going into a big swell, all items on deck need to be well lashed down, and thought given to any water entry points. We seal our chain hawse pipe and block off dorade vents. Careful and comprehensive rig checks are essential for an Atlantic crossing in either direction. As well as taking extra fuel in jerrycans or flexible tanks, don’t forget to pre-empt fuel supply problems by stocking lots of engine fuel filters and lots of Racor water separator filters. On most crossings you rarely use the engine, but if it’s a light wind year its great to have the ability to push through a wind hole and get into the wind on the other side, more fuel gives you more options. Also, consider buying a portable transfer pump as juggling with funnels and pouring diesel at sea is a messy, troublesome job. To get the most from your fuel tankage, keep to your minimum cruising revs. 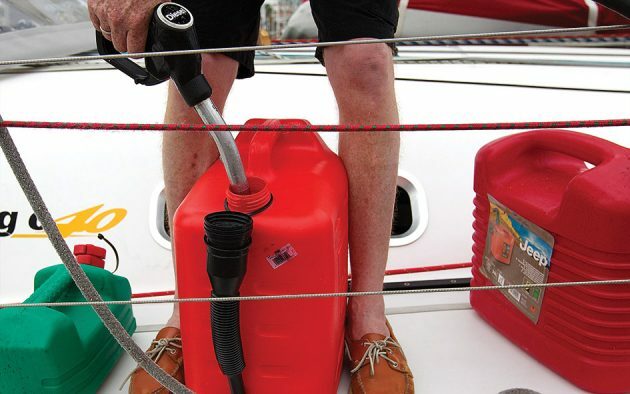 Boat manufacturers should be able to give you a fuel consumption curve for your engine so you can calculate your range based on engine hours and how much fuel is in your tank. Duncan Sweet runs Mid-Atlantic Yacht Services in Horta, providing a great service, but one that gets very busy in late April and May. He advises skippers to be prepared to do oil and filter changes themselves. “I get people coming in here to ask us to do it and I have to say: ‘No, sorry, we don’t have time’,” he says. Sweet also strongly advises that you carry key spares you might need, and replace any you may have used after your Atlantic crossing on the way out, such as pump or autopilot parts. Getting spares out to the Azores can be difficult and takes time. “The average time people spend here is four to five days. A good rigging check before leaving is essential. Your standing and running rig will now have covered thousands of salty, sunny miles and the return transatlantic crossing will see you spend long days on one tack so expect chafe to occur on sheets and halyards. A professional rigging check can be well worth the cost, but if you do it yourself make sure you work from stem to stern checking every item. Jerry Henwood, aka Jerry the Rigger, who does most of the rig checks for the ARC rally advises: “Check your standing rigging wire where it enters the swage. Is it nice and smooth? The most common place for standing rigging to break is just inside the swage and as it’s inside you can’t always see it, but you can feel it. “Look at the mast, boom and spreaders. Check all areas where anything joins, exits or is just attached. Check for any missing or damaged key rings on standing rigging, especially guardwires. Check for any loose nuts on pelican hooks on the guardwires. Check there are no cracks on the tang on the boom where the vang joins. Check struts on the radar brackets aren’t wearing away or coming loose. Check VHF aerials at the masthead aren’t loose. Re-mouse all your shackles so they don’t come undone. Should you sail to the Azores (generally Horta) or go the longer route via Bermuda? Weather systems spinning off the US East Coast bring lows and frontal systems that can extend well south, and at some point a yacht making the west-to-east crossing will be overtaken by at least one front, possibly more. So the aim is to catch and ride favourable winds for as far as possible, and most boats head for the Azores to make a stop there and then pick their timing to head across to Spain or Portugal or up to the UK. Tortola in the British Virgin Islands or St Maarten are the most popular starting points – they are well positioned and good for provisioning, spares, chandlery and repairs. But many crews make an intermediate stop in Bermuda and this is a particularly good option if the wind patterns change three to four days out from the Caribbean. In Bermuda, crews can take a break, re-provision, enjoy the island, and wait for a good weather springboard for the next leg. According to Jimmy Cornell, author of World Cruising Routes, as early as March and as late as mid-May there are reasonable chances of favourable south-easterly and south-westerly winds on leaving the Eastern Caribbean. The advice he offers is to track north-easterly towards the Azores and stay south of 30°N until 40°W. “I advocate the southerly route to the Azores,” he said, “and recommend that boats head east and stay south of 35°N until I see that nothing significant is developing. “You can stay at 32-33°N until a few days out from the Azores and then head north. Low pressure systems tend to lie further south earlier in the season and if you head north you would typically end up north of the Azores in headwinds. 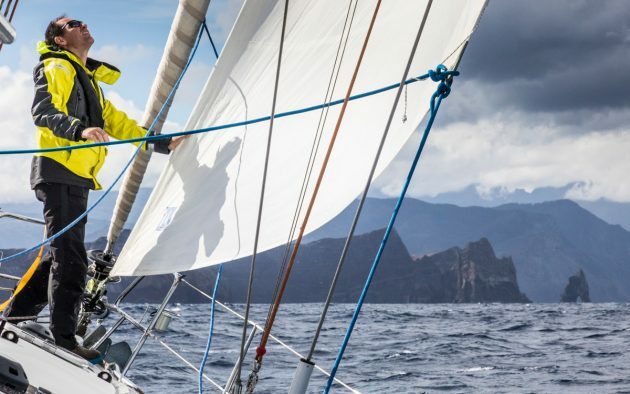 As summer approaches the lows tend to move further north and the Azores High expands so that you get lighter winds as you make your way towards the Azores. For cruisers a southerly route is generally preferable, staying south of the Gulf Stream in lighter winds and taking on extra fuel and motoring if necessary. Whether or not you’ve considered paying for tailored forecasting and routeing information on the way out to the Caribbean, it’s a good investment on the way back. In effect, you’re gaining an extra crewmember, someone with proper connectivity to put the hours into obtaining weather data including real time information from satellites and weather buoys, to work out your best options. Weather experts can provide a service as and when you need it – what forecaster Simon Rowell calls ‘leaving note for the milkman’ – or on a daily basis. A good forecaster will ask you to check in anyway and will be keeping an eye out for anything untoward heading your way. 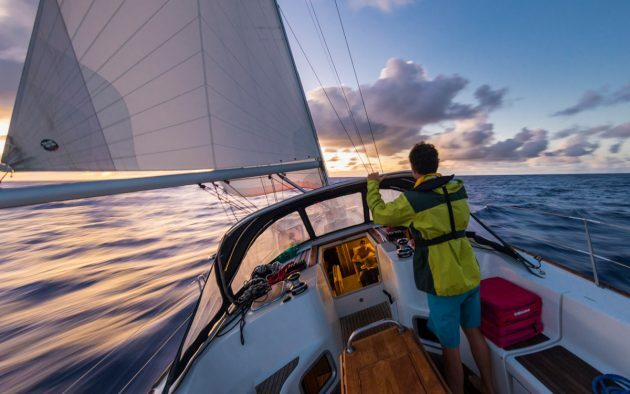 They will help you decide how to shape your route, and even adapt your sailing to, say, slow down if necessary and track south out of stronger winds. Rowell estimates his costs for providing this service to an average 40-footer doing Atlantic crossing at around £500, while Stephanie Ball at MeteoGib charges around £70 for daily 24hr SMS-type forecasts to a satphone or tracker. You can sign up to more comprehensive information and grib files, or request forecasts every two or three days. Hearty, warming meals will be required as the temperature drops. You might not have quite the number of takers for a voyage to Europe as you had on the way to the Caribbean and, as skipper, you need to think about crew who have the appetite for what might be more of challenge. 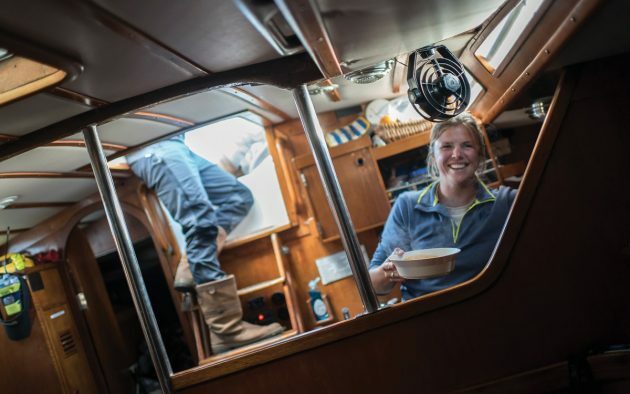 As Dan Bower puts it: “There is an increased chance of seasickness and even for those not afflicted there is less desire to do much in the way of domestic duties. On Skyelark, they make life easier by pre-cooking most of the main meals and keeping lunches and breakfasts simple, though “we carry some other celebration meals for when conditions merit; a Sunday roast is great for morale,” he says. Hearty and warming meals are needed just at a time when you will be sailing at an angle for perhaps days, so anything that makes it easier is worth investing in. A pressure cooker will come back into its own for probably the first time since you left colder waters. Round the world sailors Anne and Stuart Letton, who have sailed two-handed back across the Atlantic several times, recommend Mr D’s Thermal Cooker, a slow cooker you can put all the ingredients in during the morning, bring to a simmer and then leave to cook slowly throughout the day to be ready in the evening. You also need to unpack all those mid-layers and boots that got stowed away when you reached the Tropics. By day the temperatures might be warm enough for T-shirts and shorts, but at night it can get quite cold. This also makes watchkeeping more tiring, so you may want to consider changing your previous rota. 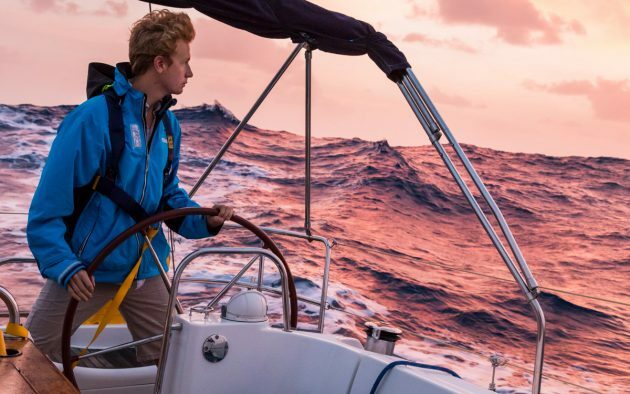 Rolling watches or double watches can help the time go by quicker, and give you as skipper more confidence and rest, though it might mean you need more crew for this route. The weather will be cooling on a west-east Atlantic crossing… but there might still be a chance for a mid-ocean swim. But the way across to Europe is one of the best ocean voyages, argues Dan Bower. “With all of the above in mind, this remains one of my favourite trips. You have powerful upwind sailing, the days are getting longer, the weather and skies becoming more interesting and the sea and bird life are plentiful. This is a rare French nautical chart or map of Alexandria, Egypt dating to 1867 (updated to 1882). Prepared by the French Depot des Cartes et Plans de la Marine, this map offers extraordinary detail both inland and at sea. In the harbor there are countless depth soundings in meters, sailing notations, and references to shoals, lights, and navigational points. Inland there is a wealth of information regarding the city proper, important buildings, topography, gardens, streets, palaces, walled fortifications, and surrounding villages. Detailed textual sailing instructions in the lower right quadrant. Glaciologists generally classify glaciers into two major types. In temperate areas, where summers are relatively warm and plenty of snow falls, warm-based glaciers dominate. This type slides easily, often slipping a few kilometers each year because water lubricates the ground and the base of the glacier. In contrast, cold-based glaciers dominate in polar deserts—the cold, high-latitude areas that receive little snow or rain. This type of ice generally stays fixed in place, rarely moving more than a few meters per year. When a cold-based glacier in the Russian High Arctic began sliding at a breakneck pace in 2013, University of Colorado Boulder glaciologist Michael Willis was mystified. 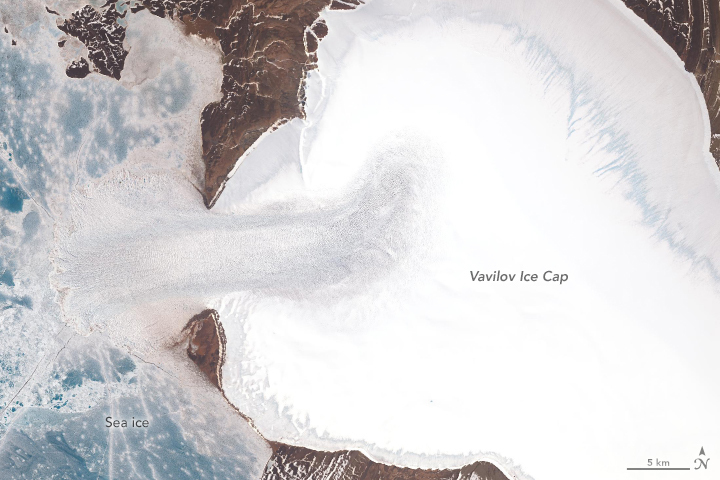 After moving quite slowly for decades, the outlet glacier of Vavilov Ice Cap began sliding dozens of times faster than is typical. 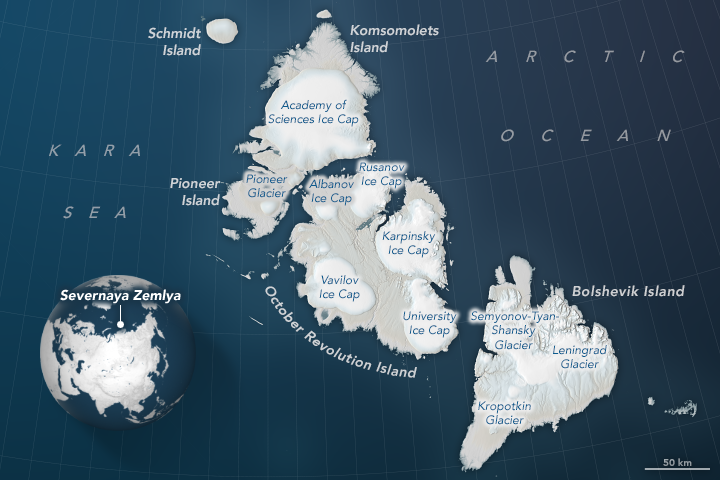 The ice moved fast enough for the fan-shaped edge of the glacier to protrude from an ice cap on October Revolution Island and spread widely across the Kara Sea. “The fact that an apparently stable, cold-based glacier suddenly went from moving 20 meters per year to 20 meters per day was extremely unusual, perhaps unprecedented,” said Willis. “The numbers here are simply nuts. 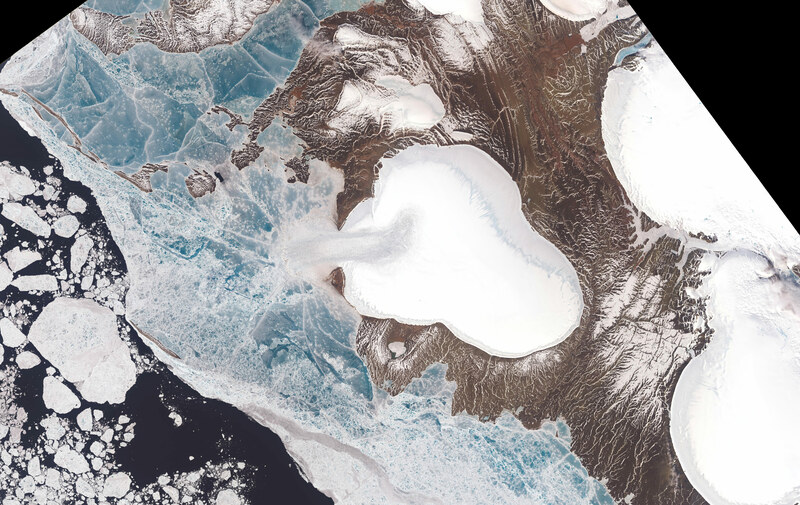 Landsat satellites have been collecting imagery of the glacier for decades. A time-lapse video, which begins with imagery acquired in 1985, showed the terminus creeping forward between 2000 and 2013, but at a modest pace—just enough for a tongue of ice to begin pushing into the Kara Sea. After 2013, the glacier sprang forward, accelerating rapidly. By 2018, the glacier’s ice shelf (where the tongue stretches over the water) had more than doubled. Meanwhile on land, the ice had thinned noticeably, particularly around the edges. Willis and his colleagues are still piecing together what triggered such a dramatic surge. They suspect that marine sediments immediately offshore are unusually slippery, perhaps containing clay. Also, water must have somehow found its way under the land-based part of the glacier, reducing friction and priming the ice to slide. NASA Earth Observatory images by Lauren Dauphin and Joshua Stevens, using Landsat data from the U.S. Geological Survey and topographic information from the ArcticDEM Project at the Polar Geospatial Center, University of Minnesota. Observations from several satellites suggests that the northern and southern edges of the glacial tongue are grounded on the sea bottom, while the middle is probably floating, another factor that has made it easier for ice to push forward at a rapid rate. 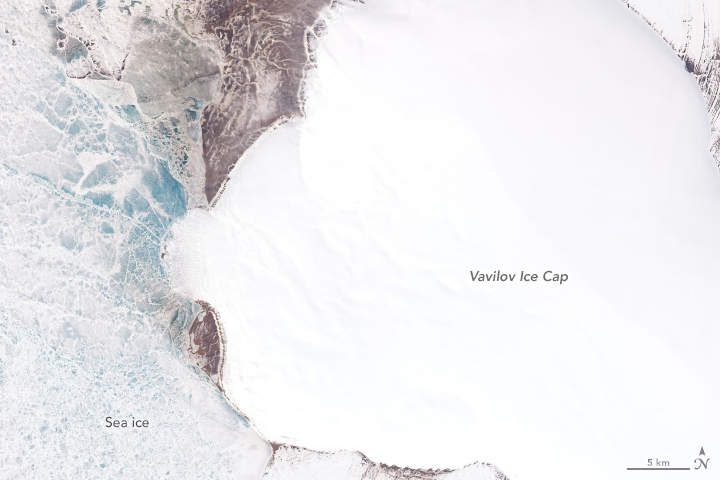 The sudden surge raises questions about the future of Vavilov Ice Cap. Though the glacier’s pace slowed somewhat in 2018, it has sped up again in 2019. “If this continues, we could be witnessing the demise of this ice cap,” said Willis. Hundreds of cold-based glaciers line the coasts of Greenland, Antarctica, and islands in the high Arctic. Together they cover hundreds of thousands of square kilometers of land. 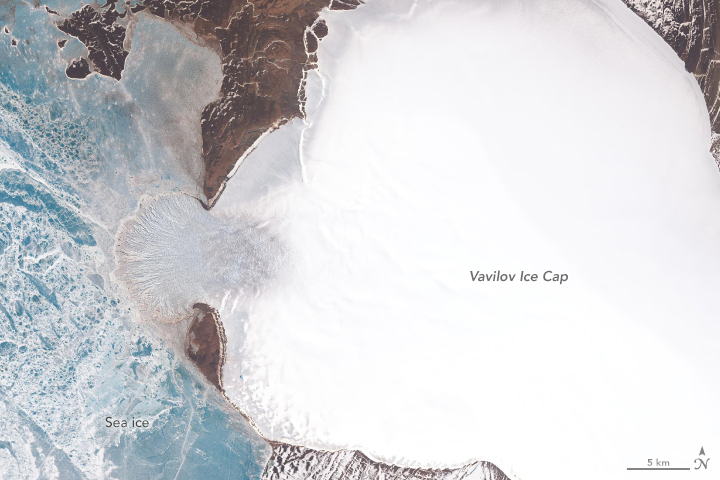 The events at Vavilov suggest that these glaciers may be less stable and resilient and more capable of collapsing and affecting sea level. “This event has forced us to rethink how cold-based glaciers work,” Willis said.